Our goal is to be client-focused, responsive and efficient. As clients increasingly demand better quality services, we believe the public sector needs to realign its work processes, delivery strategies and methods. 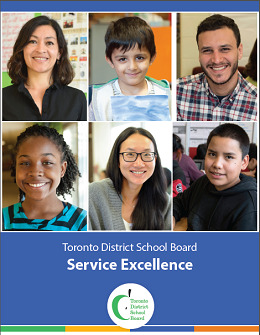 The TDSB is launching a Service Excellence initiative that aims to improve everything we do. By strengthening the way staff works together, we can build a strong service excellence culture. This will impact students, parents and stakeholders as it will improve the way we deliver services and resolve problems at different levels of the organization. The Service Excellence initiative has been developed in collaboration and consultation with a broad range of stakeholders. This process has allowed us to identify gaps and needs, define goals and establish priorities. This initiative will be rolled out in phases. The first phase will start in January 2018 and include training for departments that directly support schools.